The news has already made the rounds, but for those who missed it, the North Carolina Supreme Court could soon become a 6-1 Democratic majority. Chief Justice Mark Martin announced Friday that he would resign at the end of February to become dean of Regent University School of Law in Virginia Beach, Va.
Martin has had the longest tenure on the current high court with more than 20 years on the bench. He has been a judge in North Carolina for 26 years. His unexpected departure from the bench means Gov. Roy Cooper will get to appoint his replacement, and it doesn’t have to be someone from the same party. Cooper can either appoint someone currently on the court as the next Chief Justice and then fill that vacancy, or he can appoint someone not on the court as the next Chief Justice. He commended Martin on Twitter for his service to the state and the court after the news was released. The make-up of the high court has been controversial since the election Democrat Mike Morgan over Republican incumbent Bob Edmunds and the recent election of Democrat Anita Earls over Republican incumbent Barbara Jackson. The court oversees important decisions in cases involving voting rights, redistricting, school voucher programs, the power struggle between Cooper and GOP lawmakers, and other hot button partisan issues in the state. Those GOP lawmakers recently put a constitutional amendment before voters that would have reallocated Cooper’s power to appoint judicial vacancies to themselves, but it failed. The next senior justice on the high court is the only other Republican, Justice Paul Newby. State Republican Party Executive Director Dallas Woodhouse tweeted not long after Martin’s news that he could confirm Newby would plan to run for the Chief Justice seat in the 2020 election. There could now be as many as three Supreme Court seats on the ballot next year if Cooper chooses to elevate a current justice and appoint a replacement, which could give Republicans a chance to weaken the court’s strong Democratic majority. 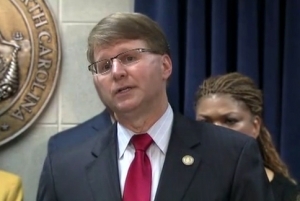 Martin told the Associated Press he was not leaving the court because of the partisan battles that have been ongoing since Cooper was elected Governor. He said that at age 55, he’s young enough to do something different and wanted to work with law students seeking to make a difference in the world. He also said in the article that he first became aware of the potential position at Regent, founded by televangelist Pat Robertson, late last summer. At 35, Martin was the youngest Supreme Court justice to join the bench. He was dedicated to improving the administration of justice and was commended by many for initiating initiated a multi-disciplinary citizens’ commission to help with that mission. He was also a main proponent of getting raise the age legislation passed in North Carolina, a law that will treat 16- and 17-year-olds in trouble in the juvenile justice system instead of the adult system. Martin will start at Regent University on March 1. The school was founded in 1978 and has 11,000 students studying on its 70-acre campus and online around the world. The university offers associate, bachelor’s, master’s and doctoral degrees from a “Christian perspective” in more than 130 program areas. M. G. “Pat” Robertson, CEO and chancellor of Regent University, called Martin a distinguished leader in his announcement that he would be taking on the new role.